There is nothing magical about intuition. 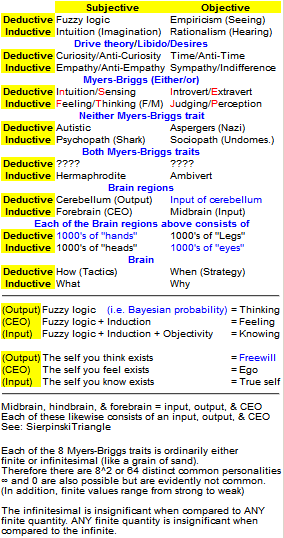 Intuition is simply the brain using inductive reasoning and massive parallel processing to determine the reasonableness (plausibility) of certain possibilities. You suspend your disbelief long enough to get a "feel" for how well the idea "fits" with everything else you know. Does it conflict with other things you know? Does it require that you make many other assumptions? Or would it, in fact, explain things that would otherwise be unexplained? Intuition can't tell you whether a given idea is true or not, but if used properly, it does tell you whether that idea is reasonable or not. Occam's razor states that the most reasonable possibility tends to be the correct one. It really is as they say: "you see what you want to see". And if you truly want to see what the facts say when they are allowed to speak for themselves then you will indeed see that too. For some people, however, intuition is simply a cudgel to bash people over the head with to force them to believe what they believe. These people are not using intuition properly. sculptor, HB3l1, samsmoot and 1 others like this. simple question: is there a single proof of a singularity in nature? Now I find it even more magical! P.S I like this definition . P.S.S What questions do you want to bring with this topic? Last edited by HB3l1; April 3rd, 2014 at 03:49 PM. I think your explanation has merit, however that's a huge topic. I think intuition can also be information processing that happens slightly below the level of conscious awareness. One experiment was set up like a card game, where the participant has to decide whether the next card will be higher or lower. In another version of the experiment, people have to guess which color light will flash next. There is a pattern involved in the sequence of cards or flashing lights, but the pattern is too complex for for most people to figure out before the session is over. What's interesting, though, is that people tend to make more accurate predictions as time goes on, even though they report that there was no pattern -it was random and they were only guessing, or if there was one, they couldn't figure it out, and they just "got lucky." But their increasing accuracy indicates that some part of their brain had started to solve the problem before they were consciously aware of having done so. It's an interesting experiment, too, because recognizing patterns is something we tend to think of as being mathmatical and a very rational, conscious activity. Last edited by DianeG; April 4th, 2014 at 08:43 AM. My intution tells me you are correct. I definitely agree. I also believe that your "intuition" fits the situation or circumstances based on what you know by employing all of the applicable senses to screen the environment around you. Thus, the "sixth sense" isn't necessarily an entirely separate sense of observation, it's more of a sum of your five senses working in parallel, in harmony, to collect as much pertinent information as possible.